Above are few point left about Aurangabad. Bhadra Maruti Temple is a highly revered shrine located near Khuldabad in Aurangabad District of Maharashtra. It is on the way to Ellora, about 25 km from Aurangabad. It is the only Maruti temple, where the idol of Maruti (Lord Hanuman) is in the sleeping position. There is belief that a visit to this shrine will fulfill the desire of a person. The festivals held here during Shani Amavas and Hanuman Jayanti attracts devotees from great distances. By road, Khultabad is well connected with Mumbai and Pune. Aurangabad Railway Station is the nearest railhead..
Khuldabad may be a small town in Aurangabad district, but it is worth including it in the list of must see places when you visit Aurangabad. The Bhadra Maruti temple here has made the place an important pilgrimage center. The view of this marble white painted temple from a distance is very inviting. No crowd of devotees was there, it was not yet aarati time and we had a relaxed darshan here too. The temple is crowded on Saturdays with long serpentine queues for darshan, as it is considered to be an auspicious day to worship Lord Maruti (also called Hanuman). Devotees throng this place in thousands in the month of March, to celebrate Hanuman Jayanti. This temple is one of the two places where Lord Hanuman is in sleeping position. The other one is in Allahabad. "Khuldabad previously known by the name of Badravati Nagar was ruled by King Bhadrasen, a kind and pious man. King Bhadrasen used to sit singing bhajans in praise of Lord Hanuman on the banks of Bhadrakund Talab. One day while the King was singing the devotional songs, Lord Hanuman appeared in front of him. Listening to the captivating music, he fell asleep on the ground. Later, Lord Hanuman pleased by the astute devotion of King Bhadrasen, granted him a wish. The good King desired that the Lord would stay there forever and fulfill the desires of all his devotees. Lord Hanuman granted the wish and disappeared. Much later, an idol of Lord Hanuman in a sleeping posture was found where he had stood. That's how the name Bhadra Maruti or 'Sleeping Hanuman'." The interiors of the temple are in marble and the ceiling at the entrance had numerous designs and hymns written with painted mirrors. OrgThe sleeping hanuman idol is covered with orange colored sheet and garlanded with a string of banyan leaves. Outside the temple there are rows of shops selling various puja articles and food items. Our next destination was the tomb of Aurangazeb in Khuldabad. Bhadravati Nagar was earlier called Ramapur and during the reign of Emperor Aurangazeb the town got its name Khuldabad. 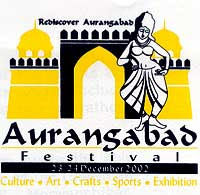 India abounds in rich cultural heritage, art and handicrafts, tradition but if one has to experience the, 'Aura' of these, its to the, 'Aurangabad Festival' - a festival to showcase, promote and celebrate the rich local culture, talent, art and heritage of a city popularly known as, 'City of Gates', - Aurangabad. 'Aurangabad Festival', promises to offer to its viewers an experience of timelessness of art, past and present, merge for an everlasting moment. An environment, in which, the city will bear testimony to a long-standing tradition of culture. A panoramic insight into the city's rich local art, culture, heritage, through classical dance performances, popular songs, folk dances, Mushaira, Qawalli, Ghazals by India's well-known performing artistes. The festival will also exhibit the local handlooms and handicrafts like Paithani Himroo, Bidri and Paperwork. The other attractions include, heritage walk for senior citizens, traditional bullock cart race, marathon, inter-school and inter-college competitions, etc.